California Vintage on Wyndham Street is a tiny, tiny drinking hole that tries its best to be a restaurant as well, but in reality, its diminutive size does not really allow it to be the fully-fledged eatery that it yearns to be. Be that as it may, I do love going there for a spot of Riesling, but I never linger long enough to have a substantial meal. However, since the fantastic renovation and transformation of the space near the Great Eagle Centre and China Resource Building in Wan Chai (by Victoria Harbour) into Brim 28, a number of restaurants, bars and cafes, including a brand new branch of California Vintage, have moved in, making that area a pretty funky, new hang-out. 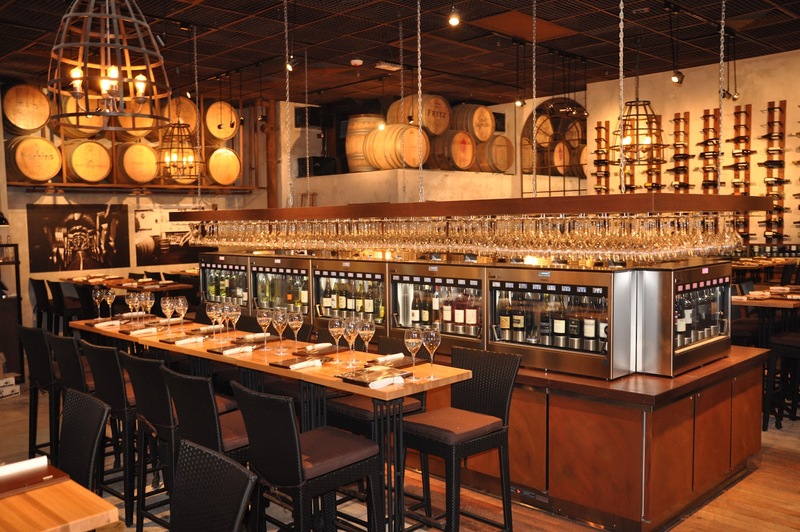 The second CV wine bar and restaurant is MUCH bigger and here, the emphasis is definitely on making sure the food does not play second fiddle to the wine and has more of a equal partnership on the palates of its customers. 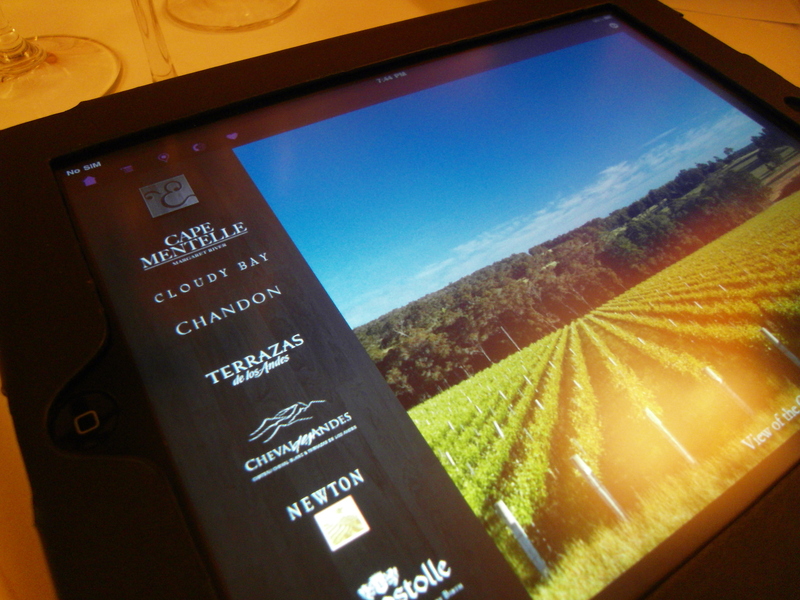 Of course, it remains a place for wine enthusiasts- there are still the smartcard-enabled dispensing machines to go nuts over at Happy Hour and clever iPad menus to help customers choose their wines. 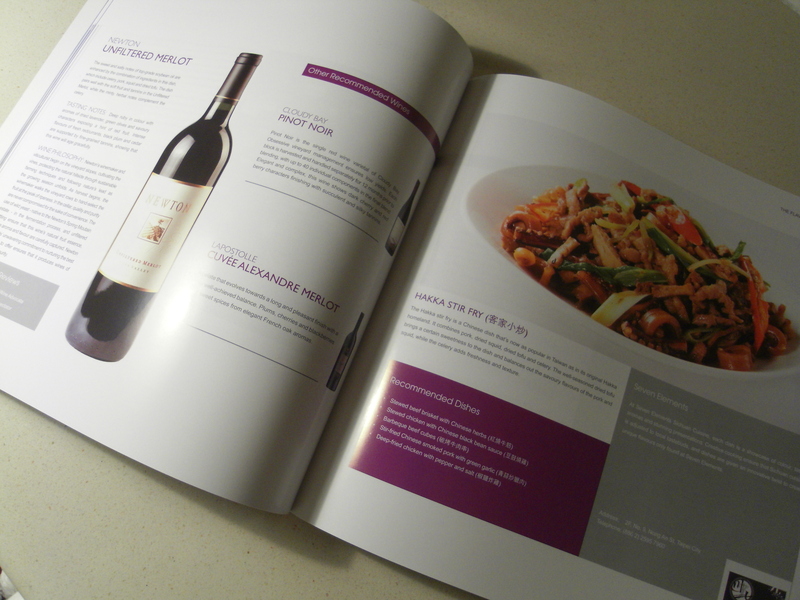 The concept of CV is to introduce Hong Kongers to the wine culture and the taste of California and their wine list boasts a fine selection of over 100 wines produced by 22 family-owned wineries across the Californian state. The wines themselves are for retail sale, but if you are popping by for a quick sip or three, you can dispense yourself some wine by the taste (1oz), the half-glass (2oz), full-glass (5oz) or just buy a bottle. A group of friends (a couple of whom who hail from/ lived in California- we needed Cali tastebuds!) and I went round last Saturday evening for what became a very relaxing meal of small bites paired with wine. The construction of Brim 28 means that each of the restaurants has an al fresco dining space outside the establishment, which makes the new CV even more appealing than the ‘flagship’ in Central. 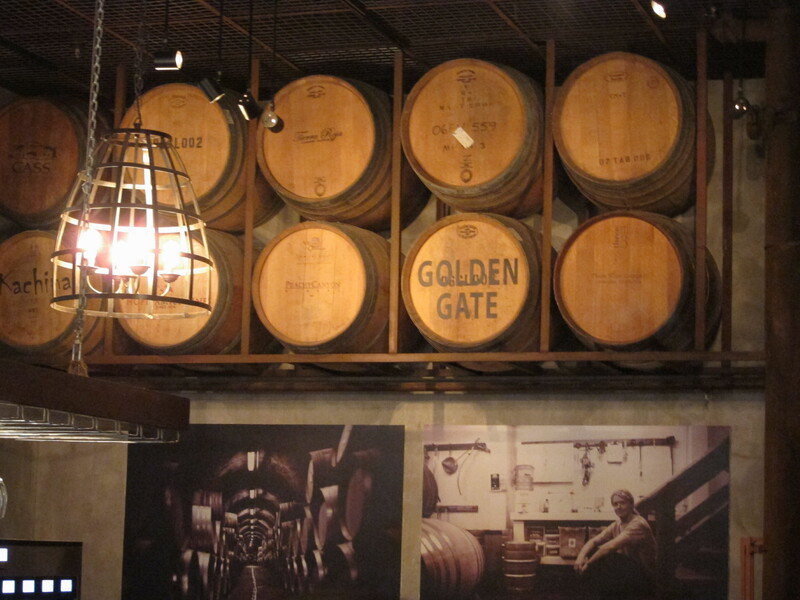 Inside, there are high tables surrounded by emptied wooden wine barrels, a display of wine bottles and the dispensing machines taking centre-stage. There’s also a lovely fresh seafood bar area that is slightly elevated and off to the left-side of the restaurant. Wine bottles have multiple uses! 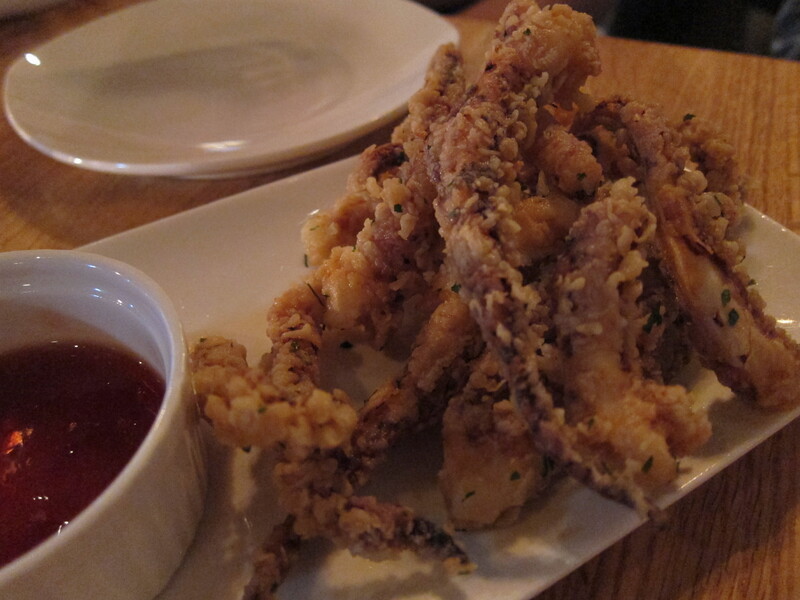 We were having their Seasonal pairing menu that night (which feature wine-inspired Californian cuisine) and our first dish was the deep-fried calamari with a tangy tomato dip. Frankly, it is quite hard to go wrong with deep-fried calamari unless it’s caked in batter (which this wasn’t), soaked in oil (which it also wasn’t) and not fresh (this wasn’t.. you get the idea). 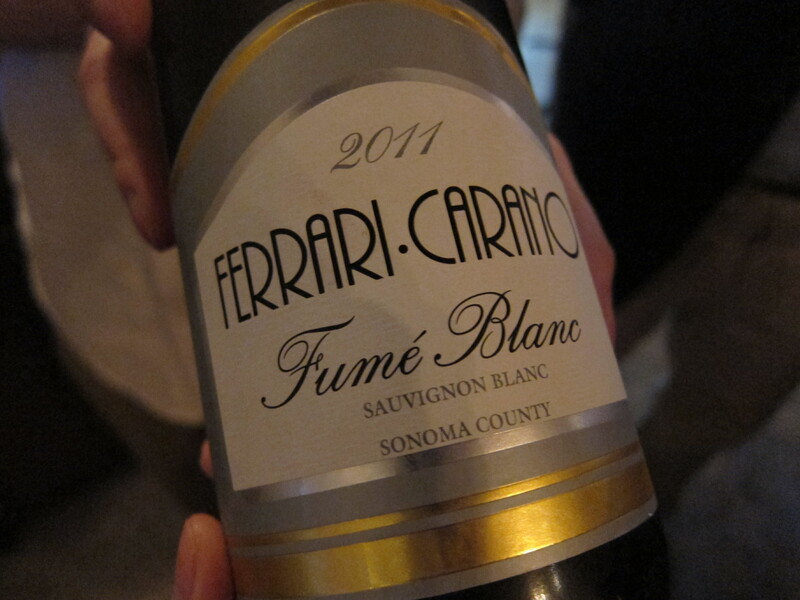 I was starving and also in much need of a glass of wine after a rather trying day at work, on a Saturday, ugh, so I positively beamed with delight at the first glass of wine that appeared- the 2011 Ferrari Carano Sauvignon Blanc from Sonoma County. This crisp white had pleasantly fruity notes with a refreshing finish and paired well with our starter dish. 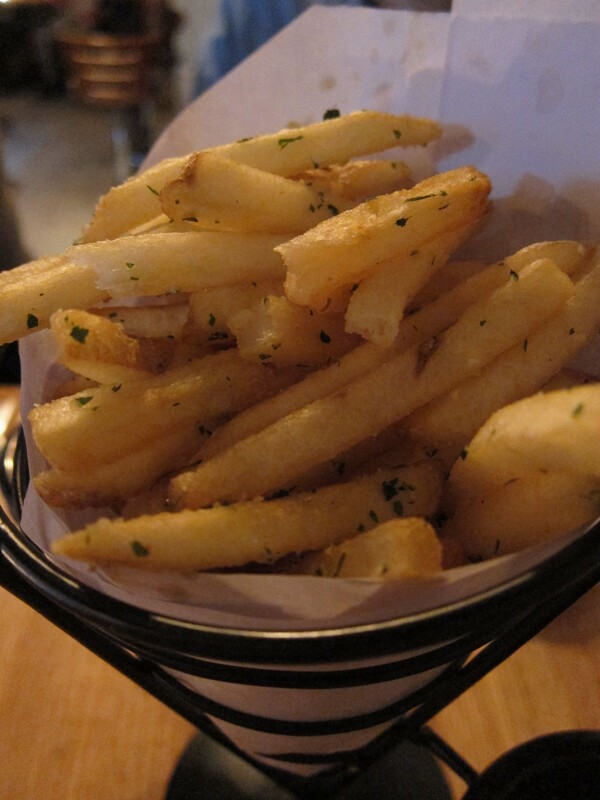 My favourite ‘dish’ of the night were CV’s Gilroy garlic fries with homemade aioli and tomato ketchup. OMG those fries are good. I had them in the original CV many moons ago, and it was love at first bite and I knew I had to stay away to save my waistline. But on Saturday, all diets were off as I chomped my way rather rapidly through them, and it was only when my friends shoved their cone of chips at me, that I realised I had had one golden stick too many. I’m easy to please, clearly! 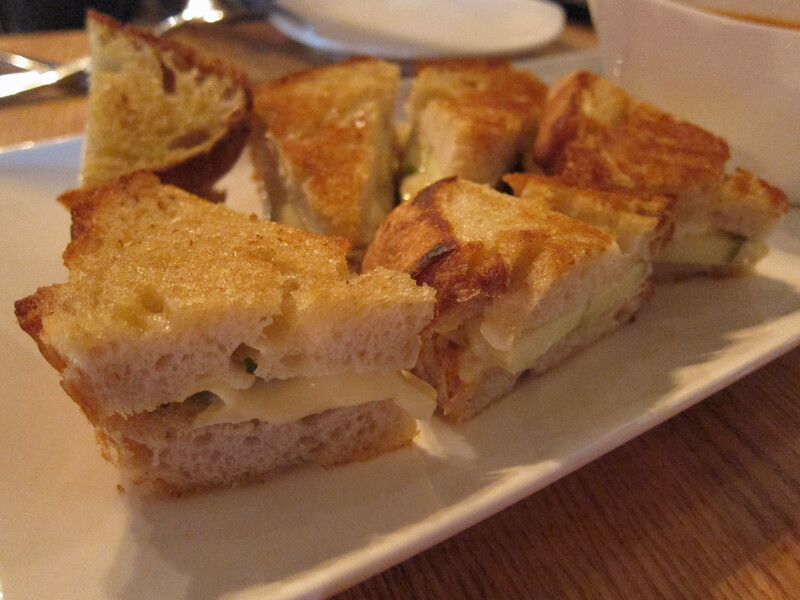 The San Fran sourdough bread with Marin Camembert cheese and green apple, served with a side of sweet tomato soup for dipping was nicely toasted, though the cheese could have done with a few seconds more under the grill to attain perfect meltiness. The Camembert itself was a little too mild, and the green apple did not have the acidity to make this a completely balanced dish, though dipped in the tomato soup, it was still very tasty. My friend and I tried to drink the soup on its own, but it was far too sweet- strictly for dipping only! 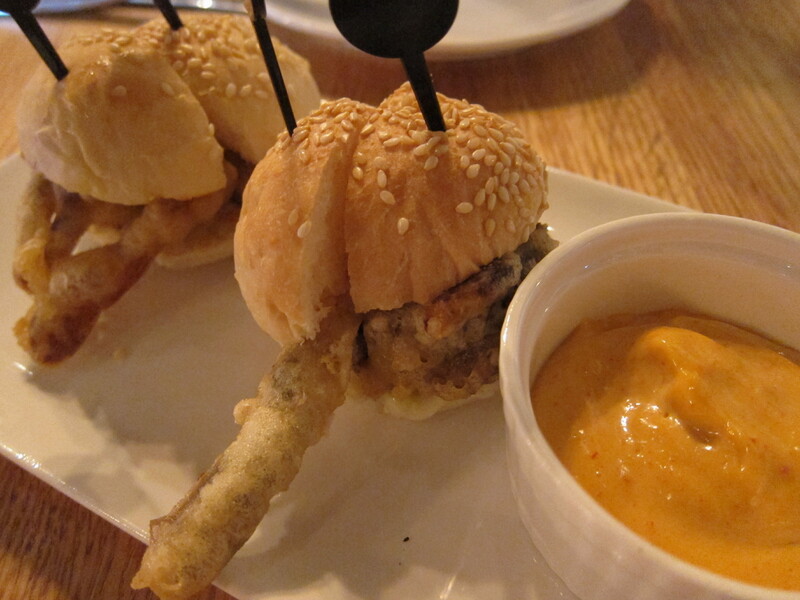 Next, were the California sliders with fried soft-shell crab. I love soft-shell crab and these mini burgers were rather sweet, with the crab legs sticking out awkwardly like they were attempting to escape. The crab was slightly bland on its own, but dipping it into the homemade chipotle aioli made all the difference. I would have liked the battered crab to be more heavily seasoned with salt and pepper, but that is just personal preference. Served alongside these dishes was the white Flying Nymph 2010 Paso Robles. This blend of 56% Viognier, 32% Marsanne and 12% Roussanne may be too sweet for some, but I enjoyed it immensely. The fruity flavours emerged after a while in the glass and the taste lingered long enough to give a nice end to our second round of dishes. 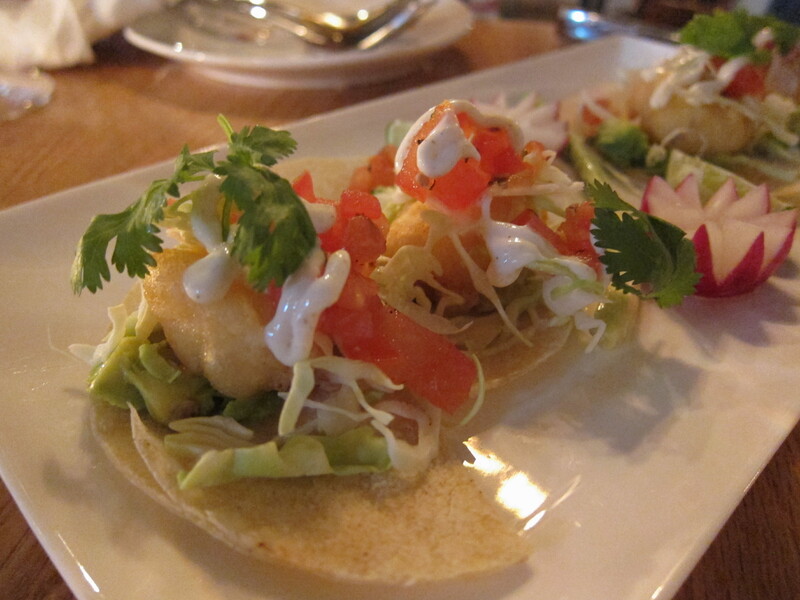 Our third round of dishes began with the California Tacos with Baja Fish. Here, the white fish were battered and served on shredded cabbage and topped with pico de gallo and cumin-enriched sour cream. The California taste-buds may like it mild, but these tacos were far too meek in taste and could have done with some punchier, more robust flavours. Not entirely sure what was missing from this recipe.. perhaps some Tabasco sauce would give it a kick. 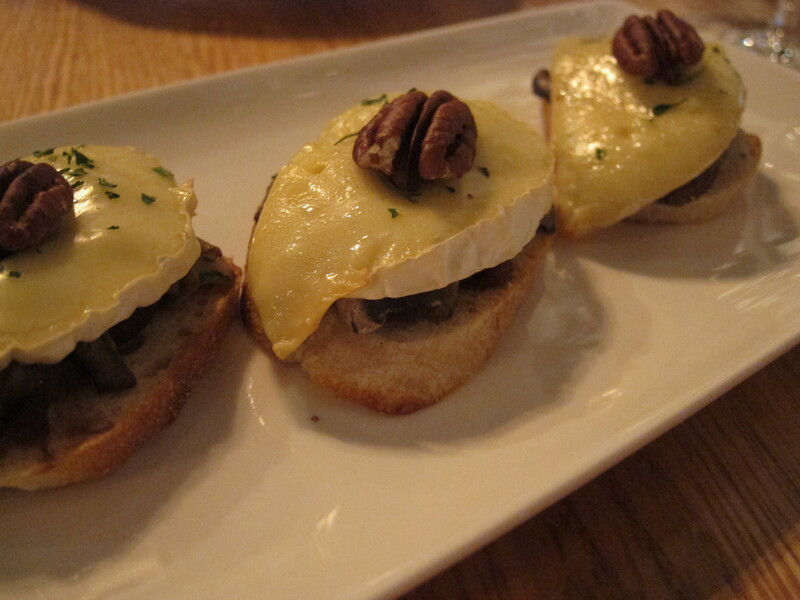 The Marin Camembert and mushroom bruschetta topped with a walnut, was a simple dish but a far more flavoursome combination than the tacos. For some reason, the camembert here worked better, perhaps there’s just too much bread in the previous sourdough sandwich to give the cheese justice. Our wine for this round was the Anaba Sonoma Coast Pinot Noir, a fairly intense red with a smokiness that was not entirely to my liking. 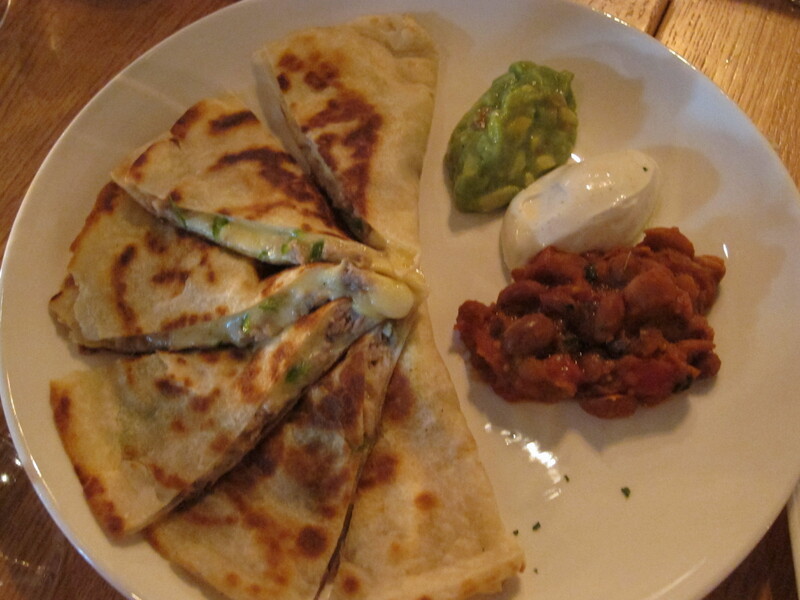 We also had the pork quesadillas made by shredding pork and combining it with green chillies and melted jack cheese. The house-made guacamole was very sweet and resulted in a few grumblings at our table. 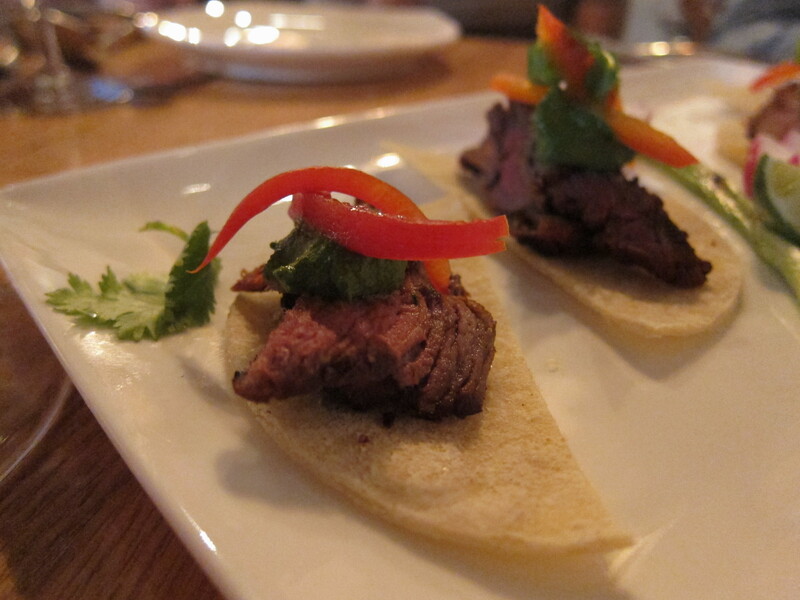 Our last round of savouries came with a glass of Stuhlmuller Vineyards 2009 Cabernet Sauvignon- California Sliders with Angus Beef Burger and Bravo Farms Cheddar Cheese and the California Tacos with Grilled Flank Steak and Chimichurri Sauce Steak. 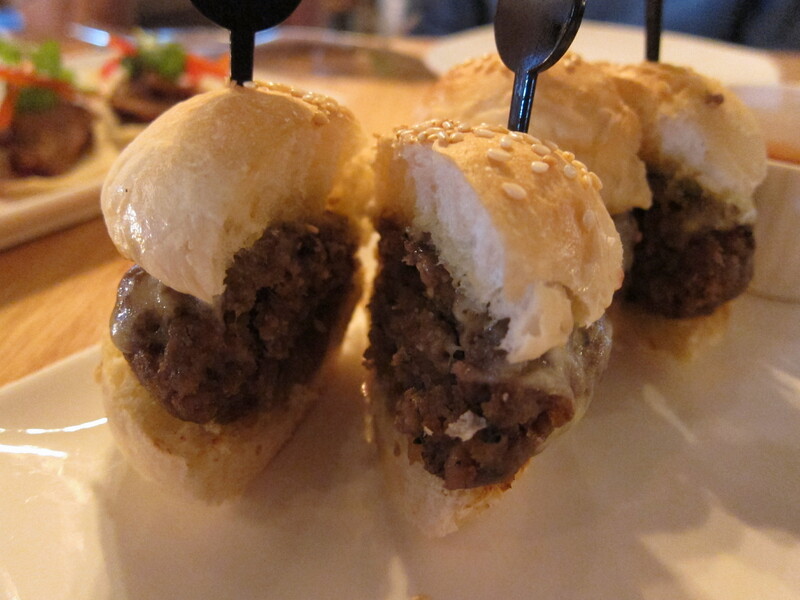 The juicy Angus Beef burger sliders were the best dish of the night together with those addictive fries! The soft corn tortillas topped with Harris Ranch flank steak were fine but again, something was missing with the flavours. Their house-made taco chips with salsa were excellent and I have to say, as carb-heavy as CV’s menu is, they do excel at the fries and the chips. Perhaps a few more salads or some Californian-taste inspired ceviche would be good additions to the menu to balance it out. 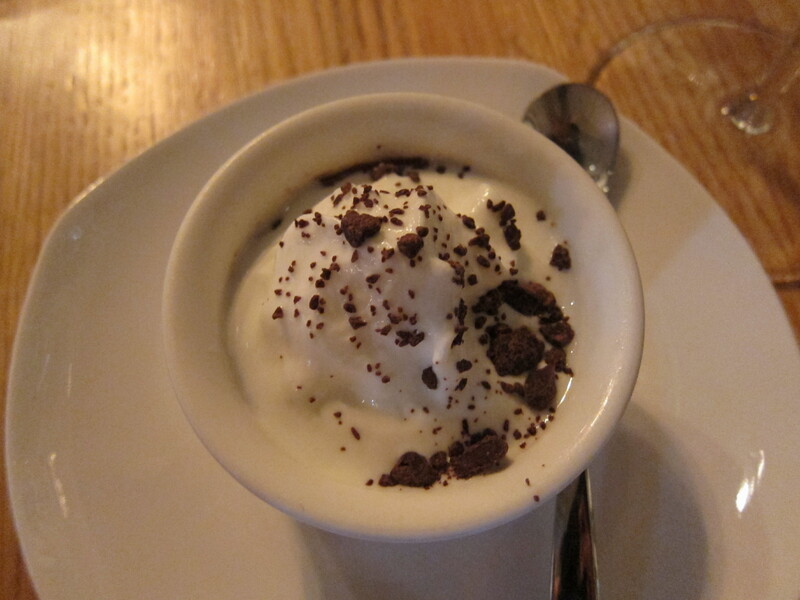 A meal is not complete without dessert. The manager suggested we just have the Chocolate Pot de Crème- a gorgeous, smooth chocolate pudding generously topped with whipped cream, but at the mention of a new dessert- apple tart with vanilla ice-cream, there was no way I was leaving CV without sampling some of that. Of course, that just meant that we had both puddings, each of us having our own pot de crème and then sharing two plates of apple tart. The pot de creme was extremely rich and gave me a massive chocolate and sugar high. I have had this before at the flagship and as delightfully satisfying as it was, after four or five bites, it was too much. 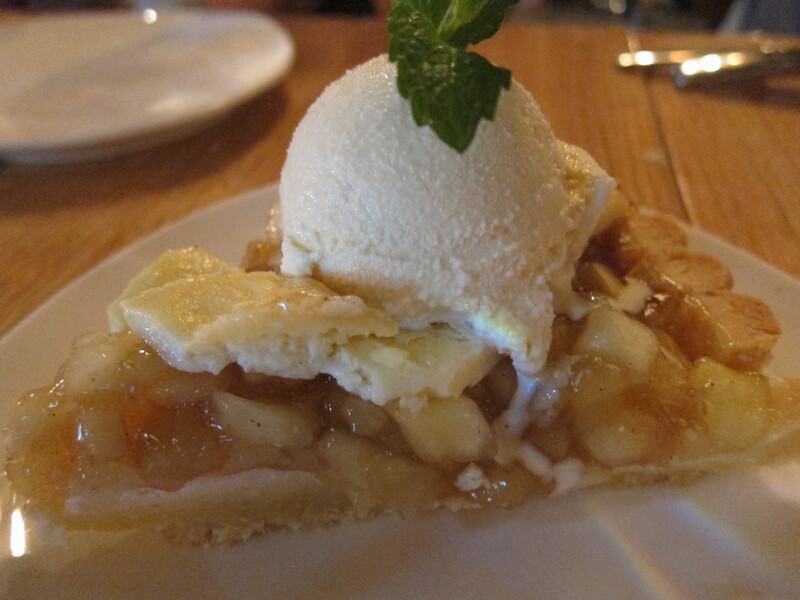 However, the apple tart was divine and demolished within minutes by our group. It was beyond yummy, the pieces of apple nice and chunky and the all important pastry was perfectly crumbly and not too thick. I am an apple crumble/ tart fiend and this was one of the best apple tarts I have had in HK. I only hope the preparation stays consistent, when I return, or I will be most disappointed. They served our desserts with a glass of R & B Cellars Fortissimo Port Dessert Wine which I did not care much for; it was far too strong and medicinal in taste, so I abandoned my glass and opted for a glass of Moscato mmmmmm. So what did I think? 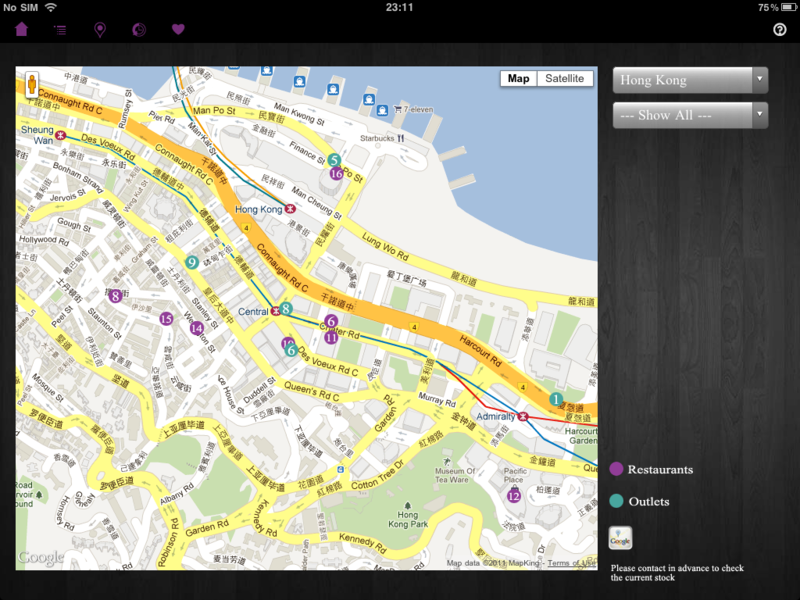 California Vintage Wan Chai has a great location and the space is fantastic. Their Happy Hour is a good deal, (I can’t quite remember the details, sorry! But I know I will definitely be heading there for a glass), but with their dishes priced between $68 (for their fries) to $148, for relatively small bites, it is on the slightly expensive end for what it is. I have no idea what ‘the taste of California’ should taste like, but I was assured by the Cali lot that the menu can afford a few tweaks here and there. 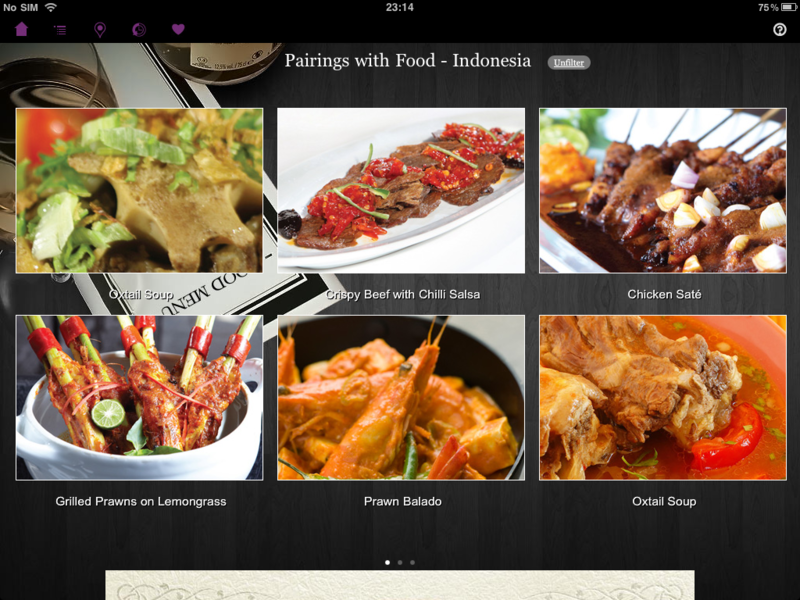 Set lunch is $88-$128 + service charge depending on what you order for mains. 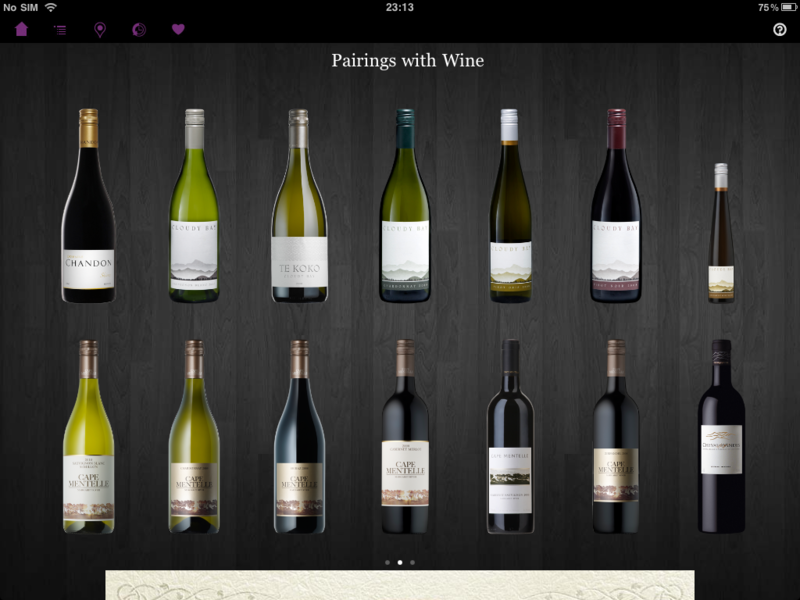 Categories: American, Wine | Tags: apple tart, Brim 28, California, California Vintage, California Vintage Wan Chai, Californian wine, sliders, tacos, Wan Chai, wine | Permalink. What do you get when you put ten foodie fanatics, three WOM guiders and one Krug expert in a private room together with bottles of champagne? Answer: an epic four hour, progressively rambunctious dinner peppered with talks of spam and bricks of butter. This was my evening two Fridays ago, when I was most, most fortunate to be invited by Krug and WOM guide for a night of champagne education and good banter at the 3 star Michelin restaurant 8 ½ Otto e Mezzo Bombana. I had been dying to go to 8 ½ Otto e Mezzo for yonks, but was saving a trip for a special occasion so I could go all out and spoil myself, so I couldn’t believe that such a dinner was being hosted. This was definitely too unique of an experience to turn down (what’s a girl to do eh?). You know the night will end well when one walks in to be greeted immediately by a glass of champagne. After a few rather large gulps, (I’d been waiting all day at work for 7pm to arrive), Regional Brand Ambassador for Krug at LVMH, Arnaud Mirey, kick-started things by giving us a wonderful history lesson on the house of Krug. 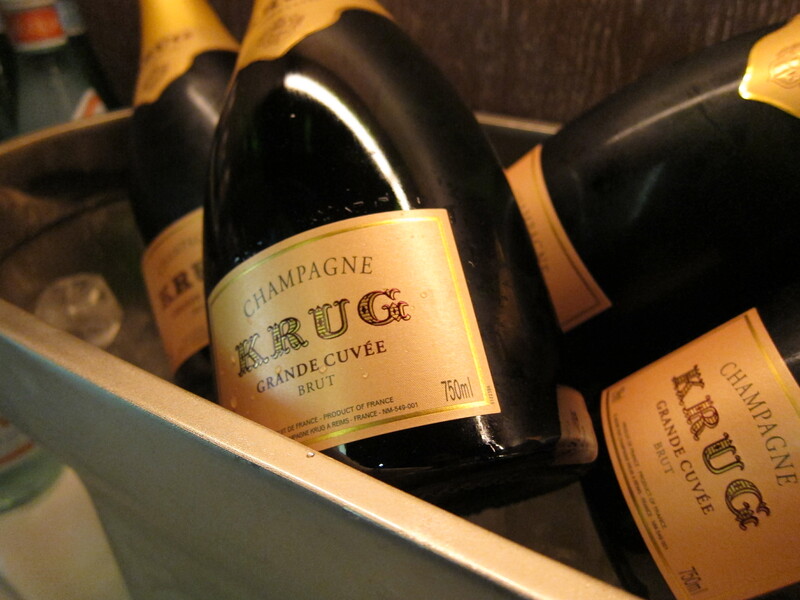 I loved hearing how Krug has in fact a German background, founded by Joseph Krug, a German immigrant, in 1843, who learnt his trade at Champagne before setting up the famous house in Reims and making it his own, thus solidifying the presence of Krug in the world of bubbly. More fascinating still, is how, even today, members of the Krug family aren’t permitted to travel on the same flight together, lest something should happen and the secrets of Krug are lost! 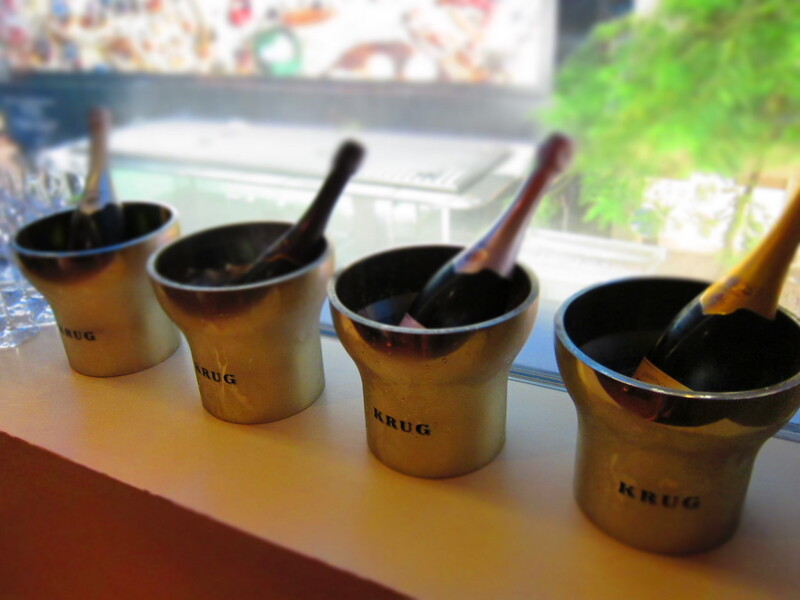 We had the privilege of trying four champagnes: the flagship Grande Cuvée, Krug Vintage 1998, Krug Clos du Mesnil 1998 and the Krug Rosé. After giving us a bit of guidance on the tasting notes, we were pretty much left to our own devices to decide which would pair better with each course. I was half drunk by the time the first course arrived, and was merrily interspersing bits of my warm lobster salad with Roast Ligurian artichoke and Cinta Senese ham with sips of the Grand Cuvée (spelt Cruvée in my tipsiness on my phone) and Clos du Mesnil and didn’t notice that my glasses were being magically refilled. 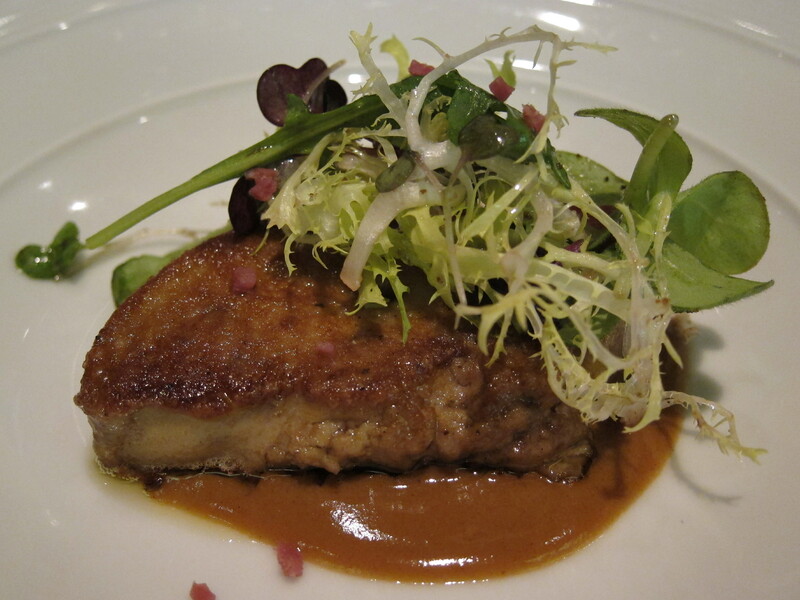 Just a little ditty about the food- the Roast Duck Foie Gras with Piedmont Hazelnut Sauce was sensational. I didn’t know what to do first, drink the Vintage 98 (which paired exquisitely with it) or eat my foie gras. I tried to savour every morsel, but great conversation and alcohol meant that it was over too soon. 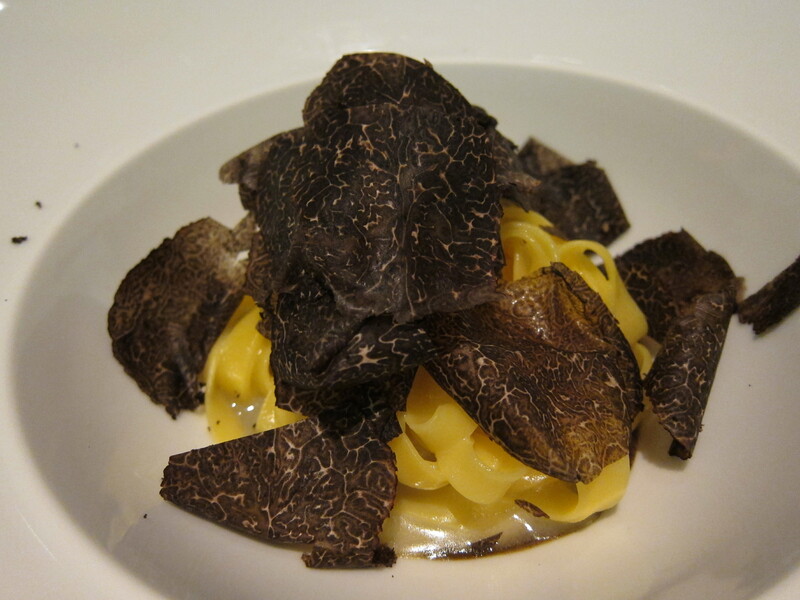 However, by then, all eyes were on the ridiculously generous amount of black winter truffle that was being shaved agonizingly slowly over our third course- the Homemade fettucine, which again, I thought, went superbly with the Vintage 98. Or maybe I was just letting the champagne control my taste-buds and I was too happy to with my glass of Vintage! 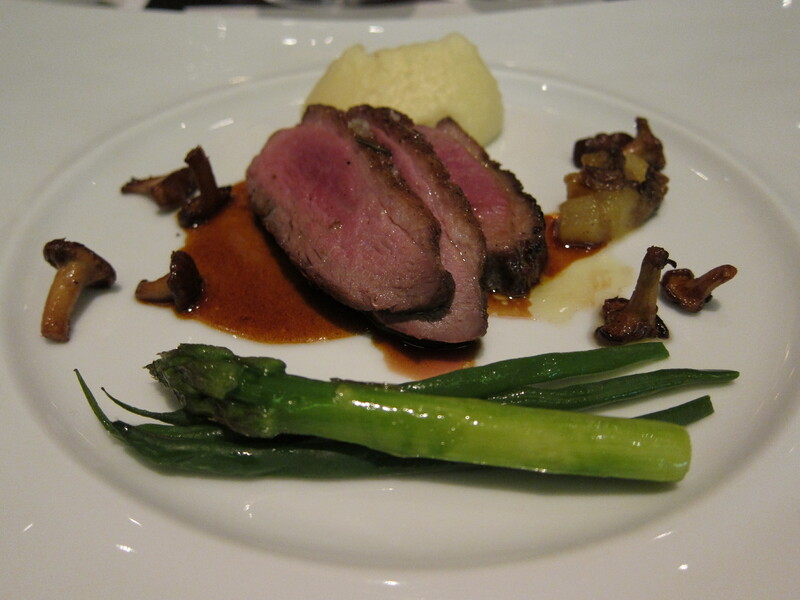 I can’t remember what went with the excellent Spiced Roast Challans Duck Supreme with apple and eggplant compote, I’m pretty sure I was still drinking the Vintage, but the Crispy Pear Tart, was a scrumptious sweet ending with the Clos du Mesnil. 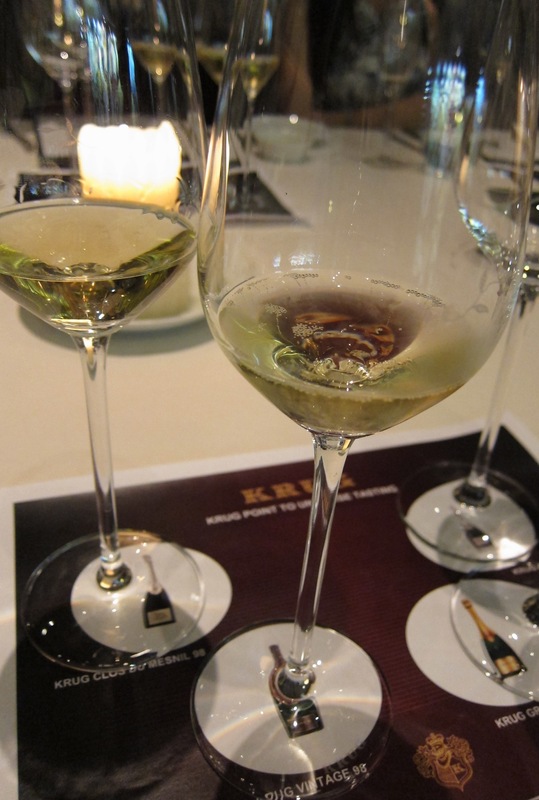 The Clos du Mesnil 98 and the Krug Vintage 98 were by far my favourites of the four. Somehow I managed to cobble together some educational notes for myself. First up, I learnt about the elegant, highly sought after and eye-wateringly expensive Clos du Mesnil 98, which is unique in being a single vineyard (Chardonnay grape), single vintage, blanc de blancs, bottled in the village of Mesnil-sur-Oger. The vineyard is surrounded by a wall and used to belong to monks. (I have no idea why I chose to take this bit of information down, but it seems nice to share!). It has a beautiful pale golden colour , a blossom smell and a sweet honey, fruity flavour with bready notes. The wonderfully long after-taste makes this very memorable. 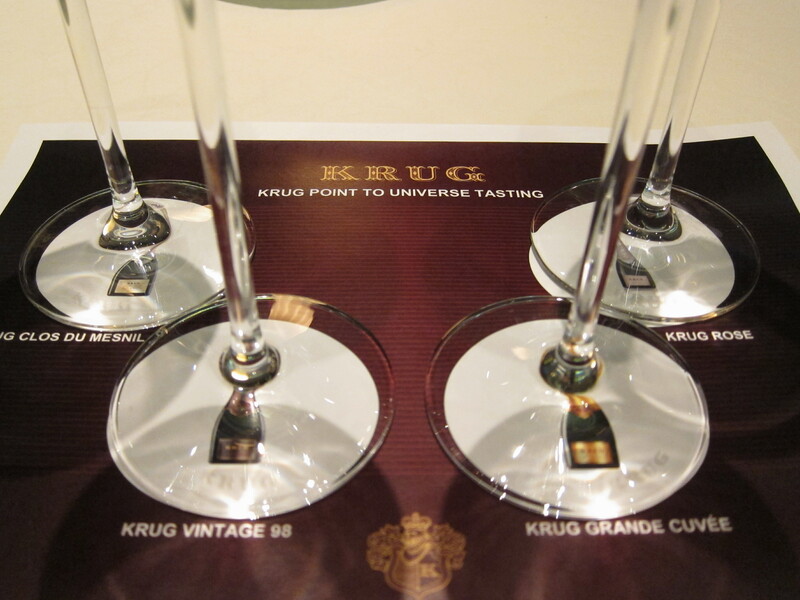 I loved the Krug Vintage 98. 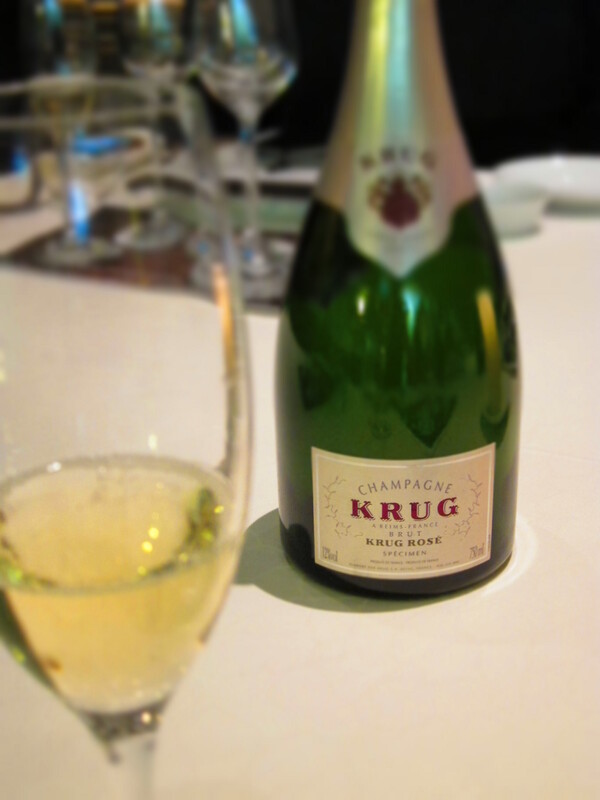 This champagne, the last Krug vintage of the 90s, has a lovely soft spice, nutty, gingerbread aroma and flavour to it. Very easy on the palate and honestly, goes down a little too smoothly. Dangerous. Lucky this stuff can’t be found in your local supermarket, or else I’d be broke. As the dinner went past the halfway point, conversation turned to spam. One foodie couldn’t believe we were talking about this tinned meat favourite of WWII, but too much fun was being had discussing spam potluck gatherings, how to prepare spam, how to optimise the caramelisation of pan-fried spam. You get the idea. We also ended up talking about butter as if it was bricks of gold, much to Arnaud’s amusement. If you passed our room and heard a lot of ‘oohs’, followed by, ‘oh noooooooo, ughhhhh’ it was most probably because we’d just discussed how rubbish it is when croissants are made with margarine. Travesty! Anyway, back to the champagne, and the Grande Cuvée, being the flagship, is of course, lovely to drink as well. 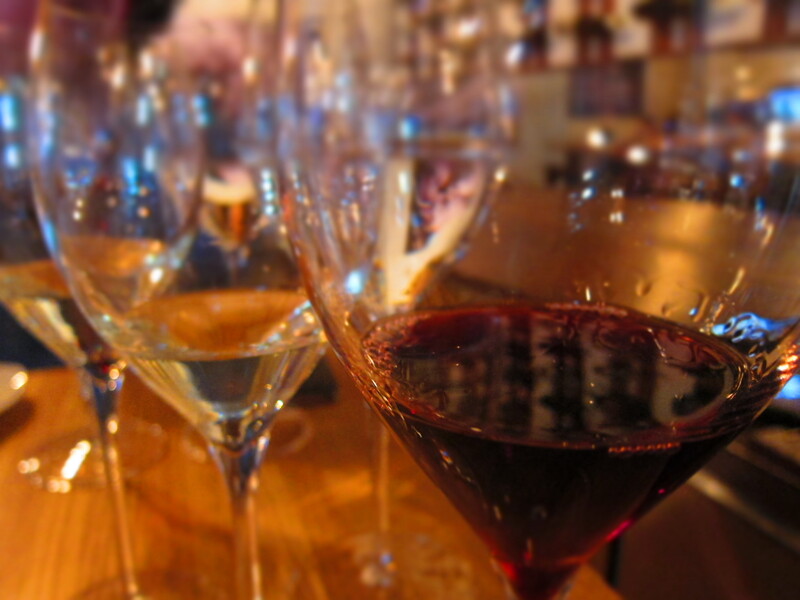 It is multi-vintage, as 50% of the blend is made of reserve wines from three grape varieties. Some of the wines have been aged up to 20 years before they are used for the Grande Cuvée, and up to 200 base wines may be used for this blend. It’s special as it shows signs of maturity: an extra stay of 6 years in the cellars after the blending process cements its finesse. 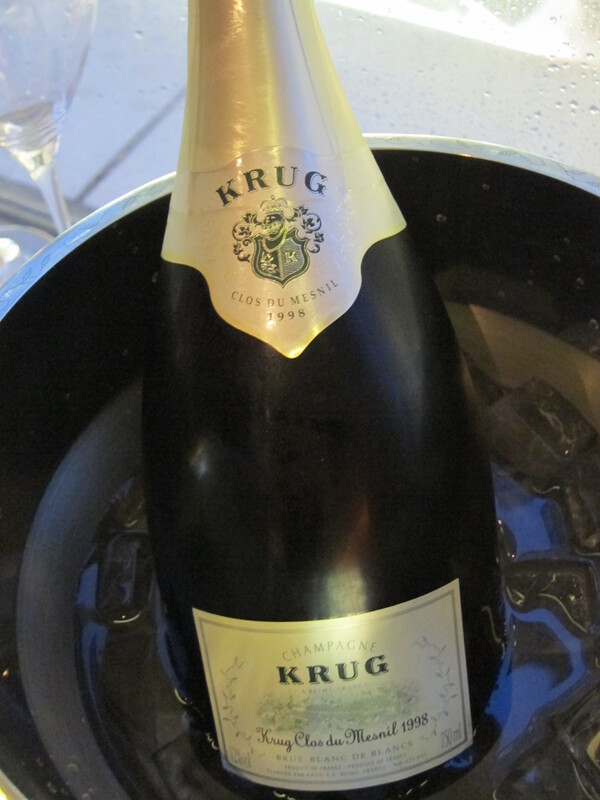 I enjoyed the Krug Rosé, (which I think I’d prefer drinking on its own). It’s nice and girly with its pretty pink flush and delicate flavour and is made from a blend of 10%, skins included Pinot Noir, with the remainder being a white base. I showed all 4 champagnes a lot of love that night, so much so that I face-planted onto my bed when I eventually got home and could barely support my head weight. I’m not sure if I was lucky but I didn’t have a hangover the next day. So I reckon drinking Vintage is the way to go! 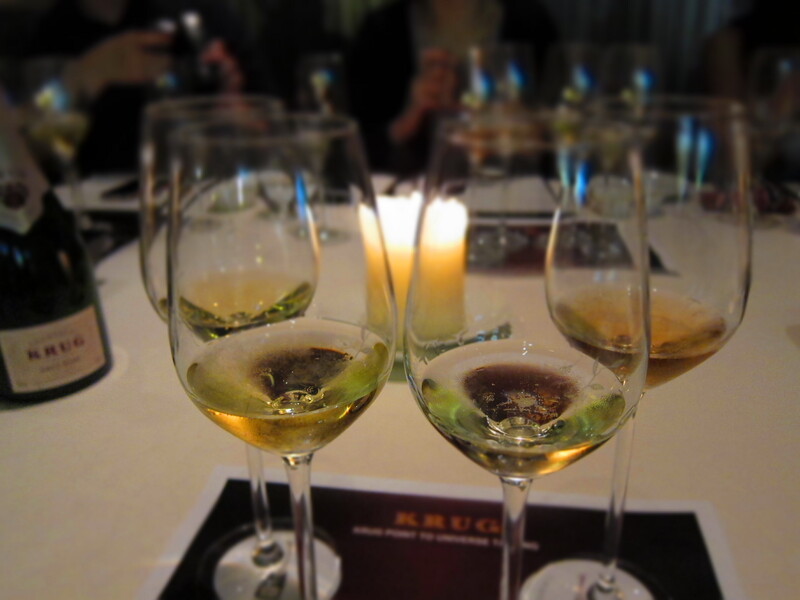 Thank you WOM guide and Krug for such an enjoyable evening. Great company is always integral at meals, but coupled with an impeccable menu and fine champagne I’d say that that night had the very best of combinations. You will probably have read a few recounts of the same evening from my fellow foodies and the reason for all our quick write-ups is because we have a special prize of a private Krug room dinner for 12 people being dangled in front of us! All our write-ups will be uploaded to the WOM guide and links placed on their Facebook page. 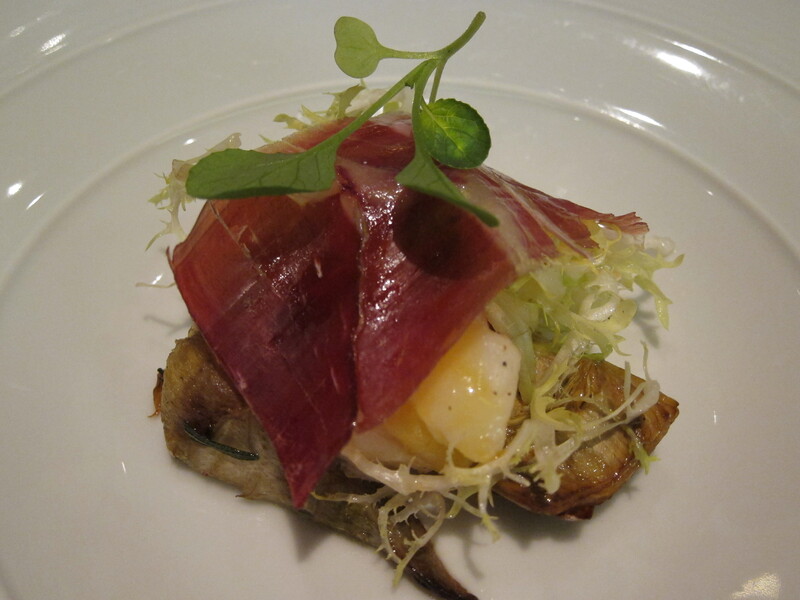 The blog with the most LIKES wins this dinner, so take a look and ‘like’! Categories: Italian, Wine | Tags: 3-star, 8 1/2 Otto e Mezzo Bombana, Central Hong Kong, Champagne, Clos du Mesnil, Grande Cuvée, Hong Kong, Krug, Landmark Alexandra, Michelin, Vintage | Permalink. 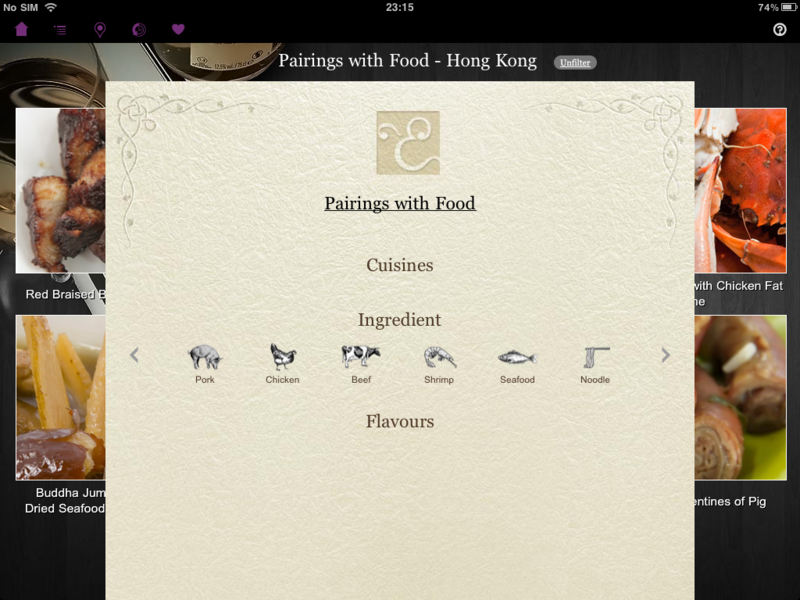 Time flies when one is enjoying oneself too much, and I realized that I’m way overdue following up on the Moët Hennessy Estates and Wines iPad app dinner event that took place at the end of November. 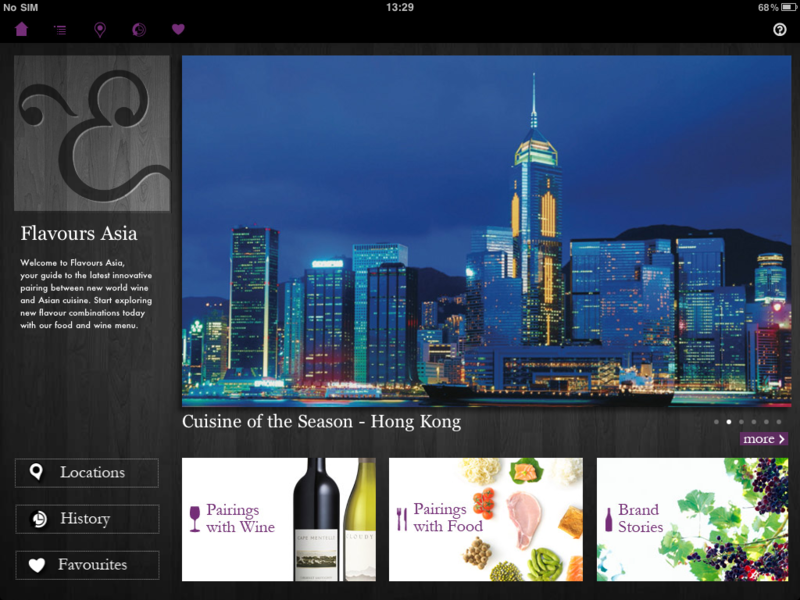 Quick recap- a few of us were lucky to be invited to indulge in an evening of wine and food over the celebration of the launch of the MH E&W iPad app, the idea which, if you recall, helps us pair wines with Asian dishes. The dinner took place at Island Tang, Galleria Plaza in Central. Every time I go, the interior makes me imagine what a 1920s gentleman’s club would look like, with its bold lines, patterned art-deco carpet, retro paneling and cool looking chandeliers. FYI I usually go for their amazingly succulent, soft and tender Char Siu, so that night, it was the first time sampling different dishes from the norm. The event took place in one of their private rooms, where amongst fellow bloggers and quaffing a few glasses of wine, we ooh-ed and ahh-ed over the new iPad app and played with the iPad (of course). 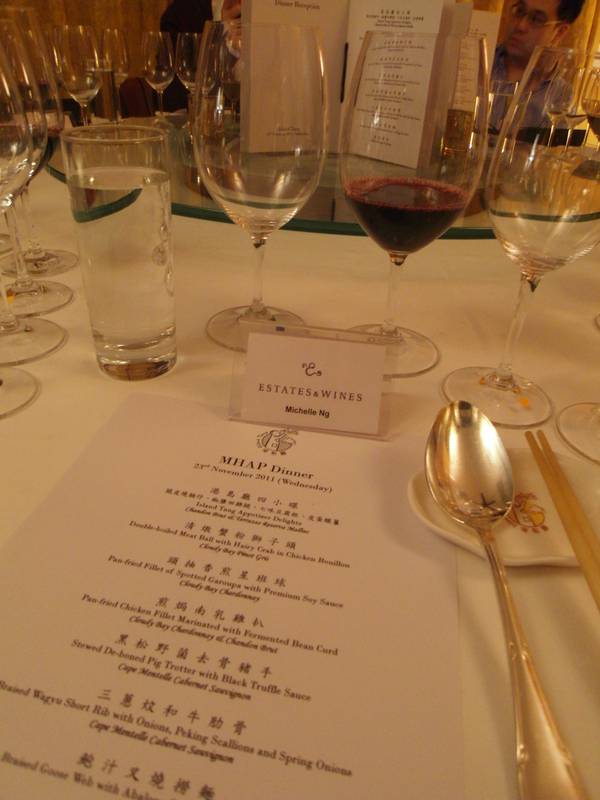 The dinner was a whopping 8 courses, which translated to a lot of booze that night, as it was a wine pairing event. 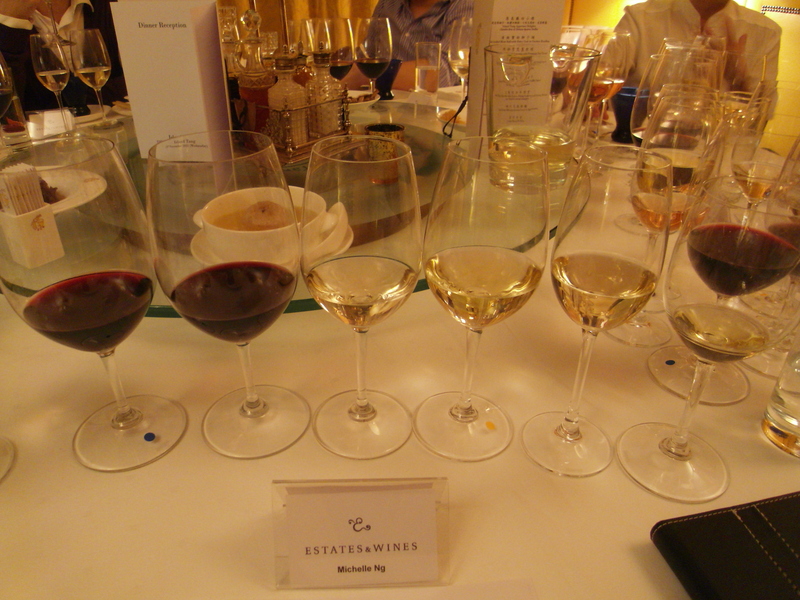 I’m not the biggest wine drinker, so I was hoping that I wouldn’t fall in love with any of the wines presented and get stonkingly drunk at the table. To start we had the Island Tang appetizer delights- a slice of thousand year old egg, a couple of slices of roast pork to whet the appetite, chicken wing and salt and pepper tofu cubes. 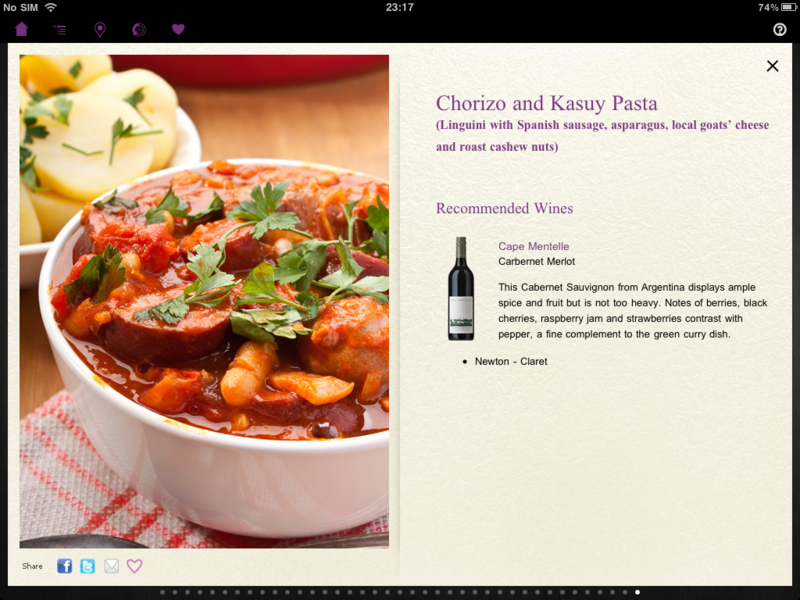 With this, we had a chance to try and compare the Chandon Brut and the Terrazas Reserva Malbec. Brut is always easy on the palate, it’s crisp, fresh and fruity. The Malbec was a lovely, soft red and had a wonderful fruity aroma. 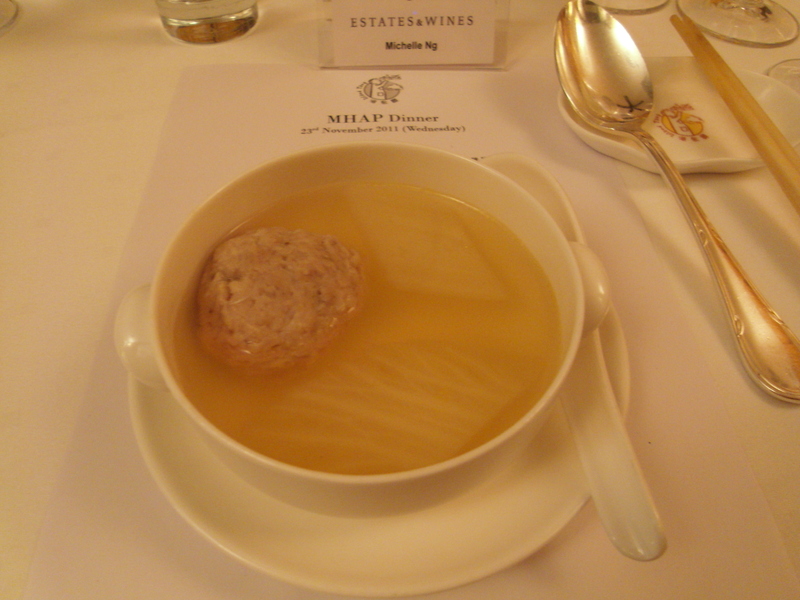 The next course was a double-boiled meat ball with hairy crab soup which, unusually, was paired with a wine. 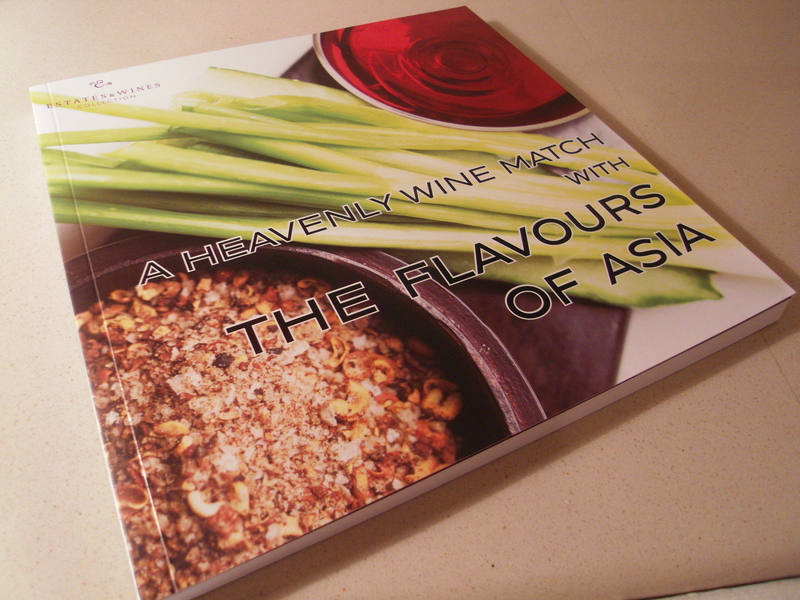 We were all commenting on how Chinese cuisine always has soup, and that it was a challenge to see if a wine could be paired with a soup, especially as it’s liquid with liquid! On this occasion, the Cloudy Bay Pinot Gris was paired with it, and went rather well, though I think this was more to do with the giant meat ball than the soup base itself. The pan fried garoupa was accompanied by and complimented the Cloudy Bay Chardonnay. This particular way was more full bodied and creamy, an elegant drink with a fruity oakiness. We were given both the Chandon Brut and the Cloudy Bay Chardonnay to try with the chicken fillet, and I decided that I preferred it with the Chardonnay. The bubbles and general stronger flavor of the Brut overwhelmed the chicken a bit. 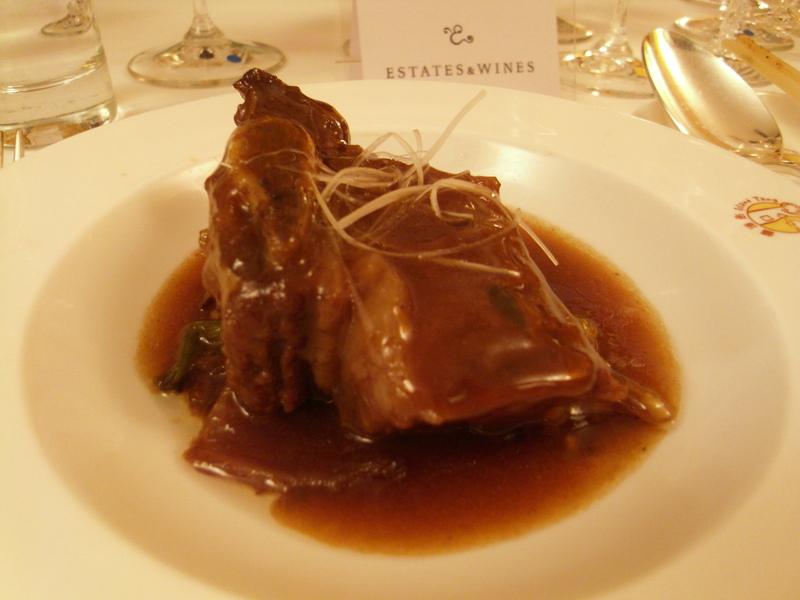 Next was the stewed pig trotter with black truffle sauce, accompanied by the Cape Mentelle Cabernet Sauvignon. The flavours from the pig trotter were quite intense and the Cape Mentelle an equally punchy wine. I preferred having this dish with the Malbec as it wasn’t nearly as intense. 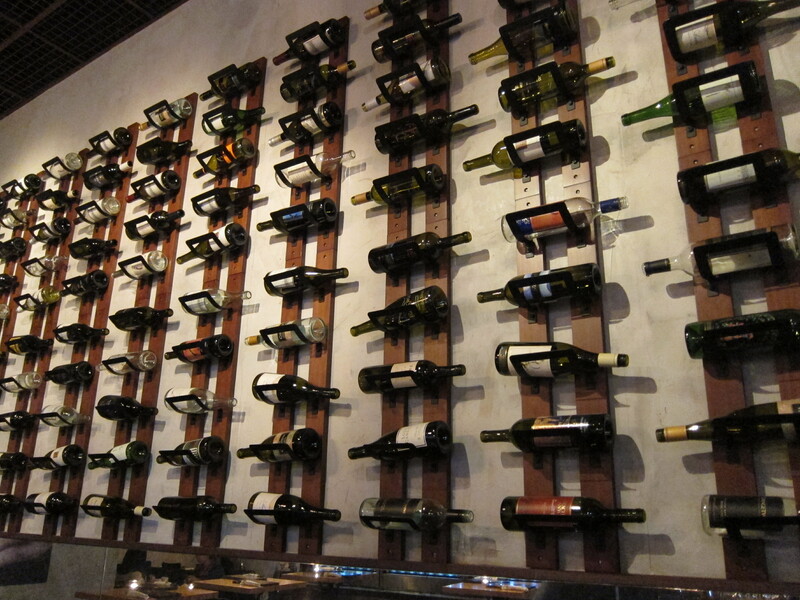 I think my palate deals slightly better with subtler wines! 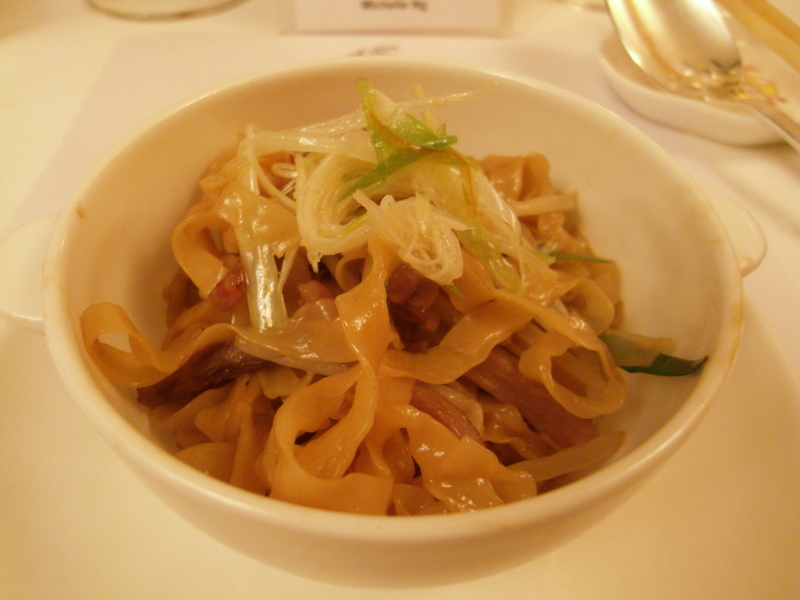 The braised Wagyu short rib, did however, go well with the Cape Mentelle, versus the braised goose web on egg noodles that went down very nicely with the Chardonnay. And so onto my downfall that night- the delectable Cloudy Bay Late Harvest Riesling, which had this gorgeous apricot taste and was so deliciously sweet (but not sickly sweet), that a few of us had to stop ourselves from downing whole bottles. It was meant to be taken with the mango pudding, but I have to confess I was more interested in my glass of nectar! 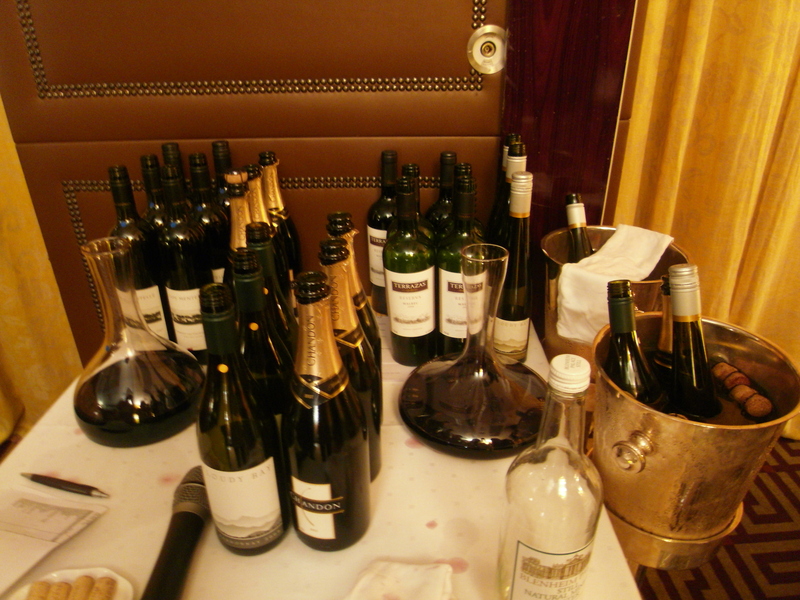 And this was some of the damage from the evening! 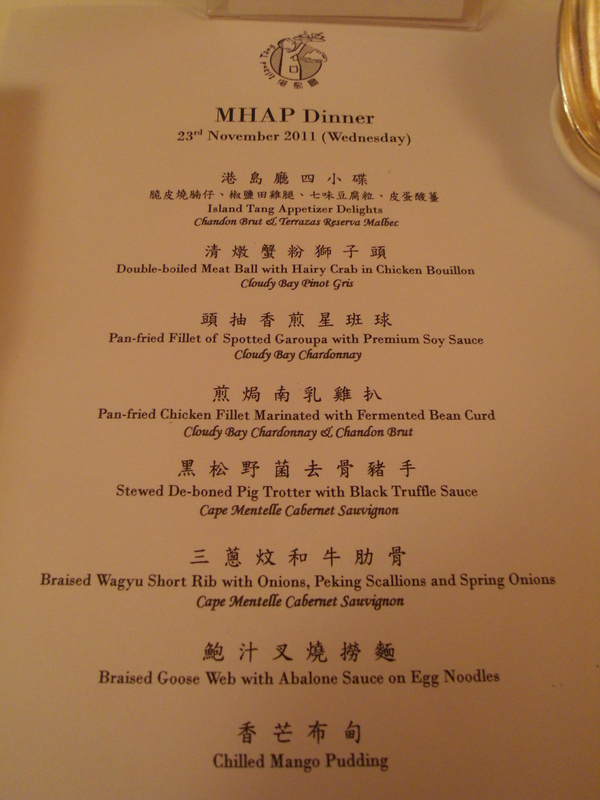 Categories: Cantonese, Wine | Tags: Cape Mentelle, Central Hong Kong, Chandon Brut, Cloudy Bay Pinot Gris, Cloudy Bay Riesling, Hong Kong, Island Tang, Moët Hennessy, Terrazas Reservas Malbec | Permalink.